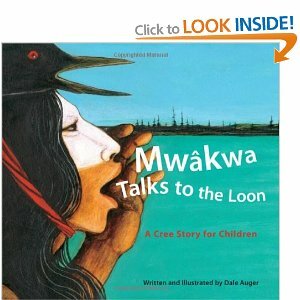 Children learning Cree deserve many more beautiful books. This page gathers a collection of some of the best. Sadly, many are out of print, and some of the most beautiful use non-standard spelling. Non-standard spelling creates a major challenge for readers and teachers. In this list, books that use standard spelling (SRO) for Cree, are labelled with a blue heart (♥). Ordering links are provided for those books that are still available for purchase. When writers make up spelling according to their own rules, all readers can do is struggle to “sound out” the words (or decode). Sophisticated speakers of Cree may be able to recognize the words (from prior knowledge). But for those who are only learning, non-standard writing creates an awful lot of guesswork. Some communities develop their own unique standards. They may achieve a level of literacy within the community, but their readers can be rendered illiterate in the face of material produced elsewhere. It does a serious disservice to children when they lose hard-won reading skills simply by being moved to a different community or school. A central goal of the Cree Literacy Network is to advocate for authors and teachers of Cree to use Standard Spelling consistently. (Consistent spelling is just as important in syllabics as in the roman alphabet.) In Cree as in any other language in the world, it is only when words look the same way every time that readers can begin to develop the fluency that is essential to real reading comprehension. ♥ Ahenakew, Freda. 2001. Wisahkecahk Flies To The Moon. ♥ Chamakese, Darryl. 2009. nipapâmohtân sakâhk. Illustrated by Joi T. Arcard; edited by Donna Paskemin. Saskatoon: Saskatoon Indian Cultural Centre. ♥ Shingoose, Regina. 2009. kîkwaya kâ-iktôtamân kâkîkisêpâk. ♥ Auger, Dale. 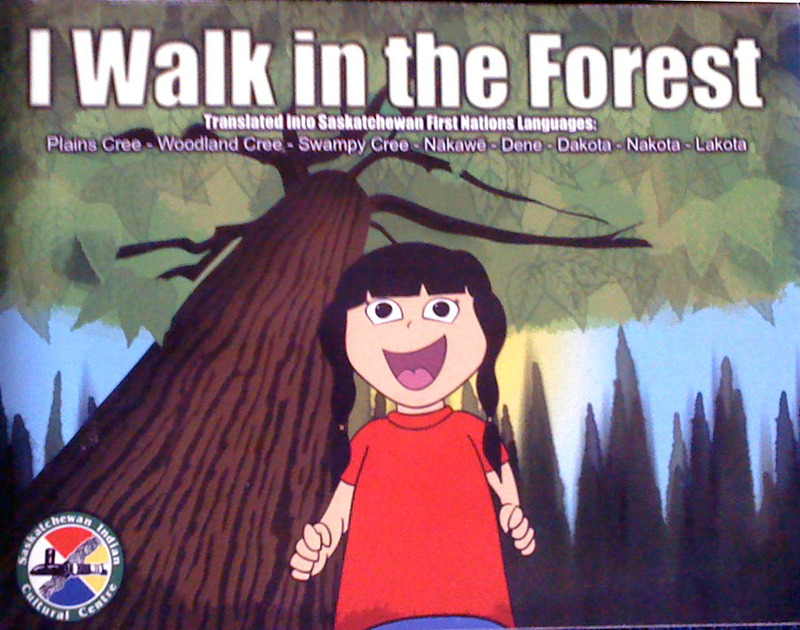 2009. kîkwaya kâ-iktôtamân kâkîkisêpâk.2006 Aboriginal Children’s Book of the Year. Ahenakew, Freda. 1988. nâpêsis êkwa âpakosîs âcimowinis: âtayohkêwin. [Cree only edition]. Illustrated by George Littlechild.Saskatoon: Saskatchewan Indian Cultural Centre. A separate, English-only edition was published concurrently by Fifth House; it too is out of print. Ahenakew, Freda. 1988. wîsahkêcâhk êkwa waskwayak: âtayohkêwin. [Cree only edition]. Illustrated by George Littlechild.Saskatoon: Saskatchewan Indian Cultural Centre. Out of print. A separate, English-only edition was published concurrently by Fifth House; it too is out of print. awâsisasinahikanis / Two Little Girls Lost in the Bush: A Cree Story for Children. Saskatoon: Fifth House. This book included complete text in both English and Cree. Out of print. Highway, Tomson. 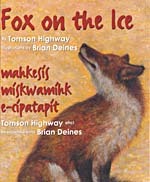 Fox on the Ice / Mahkesís mískwamíhk e-cípatapít, by Tomson Highway, illustrated by Brian Deines, Toronto: Harper Collins, 2003. Highway, Tomson. 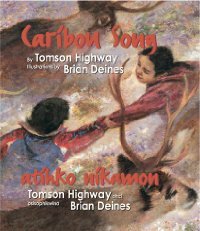 Caribou song: Atihko nikamon. Illustrated by Brian Deines. Toronto: Harper Collins, 2001. Highway, Tomson. 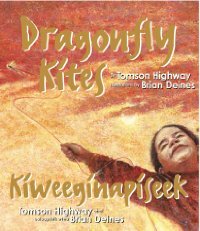 Dragonfly kites: Kiweeginapíseek. Illustrated by Brian Deines. Toronto: Harper Collins, 2001. Bouchard, David. 2007. 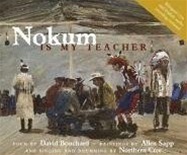 Nokum is My Teacher. Illustrations by Alan Sapp. Bouchard, David. The Drum Calls Softly.